When a client approached Herbert Smith Freehills (HSF) about a contractual dispute with one of its top suppliers, the stakes were high. The firm had to get through an estimated 40 million documents to meet a looming three-month production deadline. HSF's Alternative Legal Services (ALT) team used Relativity Assisted Review and an analytics-forward approach to find the key documents. An energy company involved in a contractual dispute approached global law firm Herbert Smith Freehills for assistance with legal proceedings. HSF’s ALT team knew applying analytics was crucial to getting the job done, considering the project’s scope and timeline. ALT employs an “analytics by default” approach to each case. 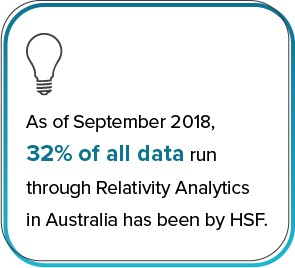 “Relativity Assisted Review and Analytics are integral to that process,” according to Arjuna Guruge, who leads HSF’s eDiscovery team in Australia and Asia. “By bringing technology, and specifically Relativity, into the fold, our team members find highly sensitive materials quicker, push as little as needed into review, and save our clients crucial time and money,” Arjuna said. Kicking off the case, HSF worked closely with their client on the initial collection of documents—including sourcing data from document management systems, network shares, email systems, local computer user drives and a large number of project servers. At the outset, the document set that required processing was around 40 million documents. By applying various filtering techniques early on, including de-duplication, high-level keyword searches, email threading, and folder path and file type analysis, the team significantly narrowed down the document set and ended up pushing only 3 million documents to the initial review phase—or just 7 percent of the original data set. After further consultations with HSF legal teams, ALT combined refined keywords and Analytics concept clusters to reduce the document review pool to 565,142 documents within a few days. Next steps entailed launching a sample-based learning project with Assisted Review to begin training the system on finding relevant documents. “We begin using Assisted Review and Analytics from the inception of each case. We start off with small sets of documents to help verify document selection for seed sets,” Arjuna explained. HSF ALT conducted one-on-one training sessions with the legal team and used specialized verification techniques throughout the project and during manual review. This approach proved effective—the team powered through reviewing nearly 600,000 documents, categorizing the relevant and eliminating the irrelevant ones. HSF ALT review teams conducted a manual review of a mere 172,611 documents at the end the Assisted Review project. “Without Analytics and Assisted Review, we would have been drowning in millions of documents.” Arjuna said. Ultimately, the HSF ALT team truncated review fees, and time, by 60 percent on the project. The results reinforce the team’s “analytics by default” mentality and role as a law firm leader in Analytics usage in the region on cases large and small. HSF’s ALT director in Australia, Hilary Goodier, echoed Arjuna’s comments. Operating from 27 offices across Asia Pacific, EMEA, and North America, Herbert Smith Freehills is at the heart of the new global business landscape, providing premium quality, full-service legal advice. The firm provides many of the world’s most important organizations with access to market-leading dispute resolution, projects and transactional legal advice, combined with expertise in a number of global industry sectors. HSF has developed a strategic and unified approach to managing cases. With staff in Beijing, Belfast, Brisbane, Johannesburg, London, Melbourne, Perth, Shanghai and Sydney, the Alternative Legal Services (ALT) team works side by side with the firm’s clients and legal teams using a unique combination of specialized skills, process, and technology to deliver a more innovative, efficient, and cost-effective solution to data and information-intensive matters.